signed lower right: "A.D. Blake"
- with J. Russell Jinishian Gallery, Fairfield, CT. In a fresh northwesterly off Sandy Hook, Shamrock II leads Columbia around the leeward mark but in a slog back to the finish, Columbia passes Shamrock II and goes on to win by 3 minutes and 35 seconds. On the right are Sir Thomas Lipton's steam yacht Erin and J.P. Morgan's steam yacht Corsair III. This was Sir Thomas Lipton's second challenge for the America's Cup. 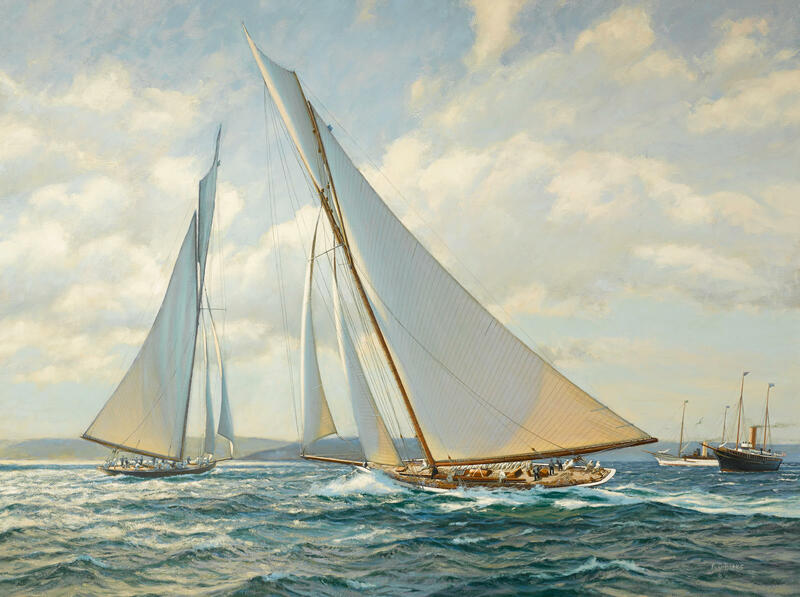 Columbia was owned by J.P. Morgan and Edwin D. Morgan, and skippered by Charlie Barr. Columbia went on to successfully defend the cup, winning all three races, and she is the only yacht to win the America's Cup twice without any alterations.